Summer is the most popular time of year to get married in Britain and although we may joke about wet summer weather, it is can be hot and sunny. A summer’s day full sunshine and blue skies looks fantastic in wedding photos, but it can wreak havoc on your hair and makeup. Here are some professional tips to stay looking fresh and cool even in a heatwave. It really pays to have a professional apply your makeup. Being pampered will help you relax on the morning of your wedding, and help you feel confident knowing you’ll look beautiful both in real life and in photographs. If you don’t have time for a trial run before your big day schedule to have your makeup applied earlier than normal so you have time to tweak it if you’re not completely happy with it. If you’re planning to do your makeup yourself it is worth having a session with a professional makeup artist who can show you how to apply your makeup to accentuate your best features and conceal any you are not confident with. Be careful about using foundation and powder with an SPF as these can bounce back flash and make you look ghostly. Take some trial pictures using the flash and camera on your phone, which will be harsher than anything your photographer will use. A setting spray, like Urban Decay’s All Nighter, will help stop your makeup from sliding off your face, as will using a good primer before you apply your foundation. Try a waterproof top coat if you don’t like waterproof mascara, and layer powder eyeshadow on top of cream eyeshadow for long lasting colour. Hot weather and stylish hair is not a match made in heaven. Humidity can make hair both flat and frizzy. Waterfall plaits are popular because they look fantastic, are relatively easy to do, and versatile enough for mid length to long hair. A soft up-do will survive the weather better than something sleek, as the latter can be difficult to prevent flyaway hairs when it is humid. A mix of plaits and curls works for most brides and is very forgiving if you are not a professional hairstylist. Prepare your hair by using a clarifying shampoo two days before your wedding to remove product build-up. 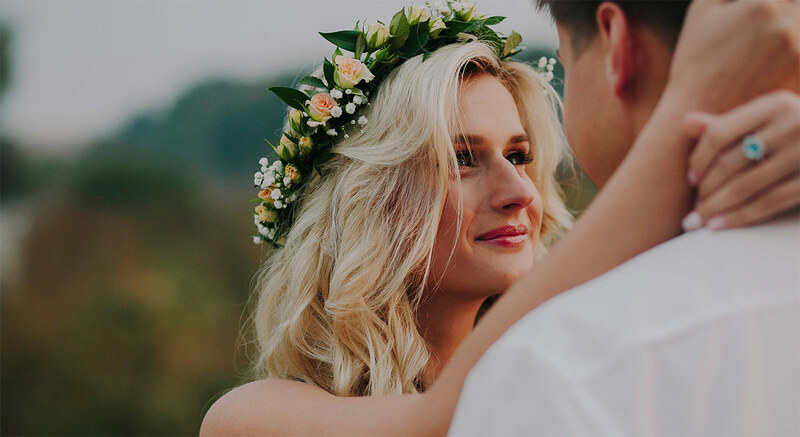 Outdoor weddings can be breezy so flower crowns, or a large flower (real or fake), will give you a bridal look if you choose not to wear a veil. Finally, select the right products for the style you want whether it’s beachy waves, a ballerina bun, or soft plaits. Do not underestimate the importance of staying hydrated in hot weather. Keep a bottle of water handy to sip from regularly and avoid alcohol at least until after your wedding photos. Natural fabrics are cooler than man-made ones, however if you are not getting ready at home they need to be transported carefully to avoid extra creasing. You will be very grateful for a parasol if you are spending a lot of time outdoors, and it also makes a good prop for your wedding photos. Apply an antiperspirant deodorant instead of just a deodorant and buy some sweat shields if you are worried about sweat patches under your arms. Botox injections are reported to work well to stop underarm sweating for up to six months but, at around £500, it is a significant investment. As much as you love the sunshine there is a big difference to the effect it can have on you lazing around the pool, and how it feels when you have to be up and active in it all day. With a little preparation you can look fantastic for your ceremony and photos, and still feel fresh when you hit the dancefloor.